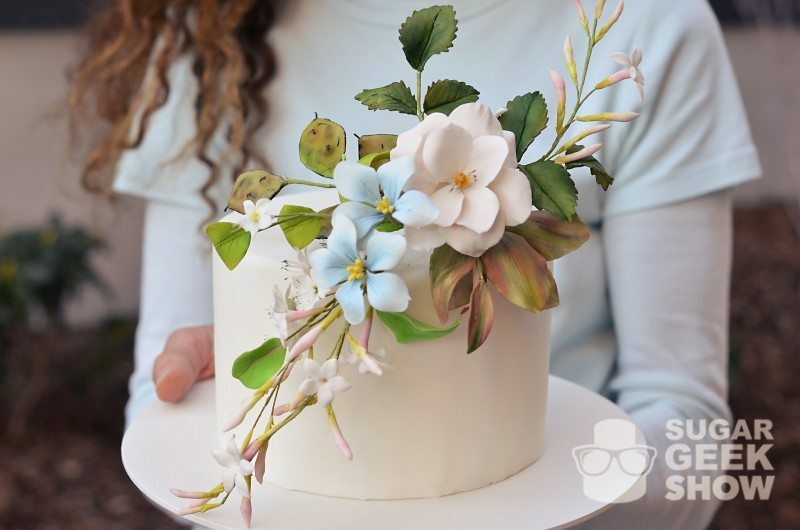 April Showers Bring Beautiful Edible Sugar Flowers! “Every flower must grow through dirt.” —Laurie Jean Sennott. Although profound, Laurie obviously didn’t know about the magical creations made from the hands of Shaile Socher or sugar flowers at all. 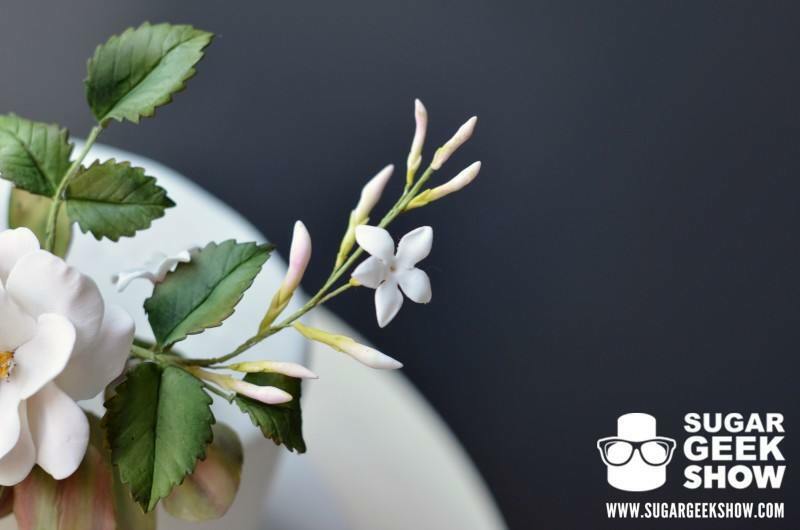 Luckily for your sake there is no dirt involved in creating sugar flowers but some individuals certainly have a special touch. 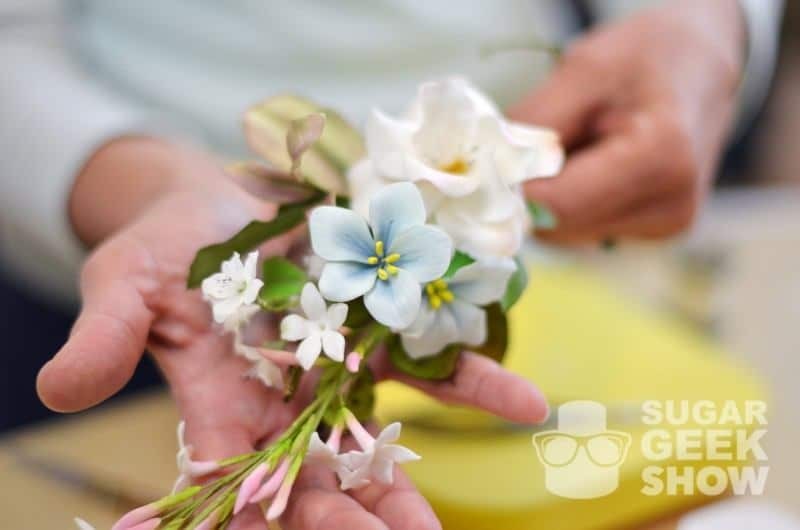 Guest instructor Shaile Socher, owner of Sugar Flowers by Shaile teaches us how to create several different stunning sugar flowers. 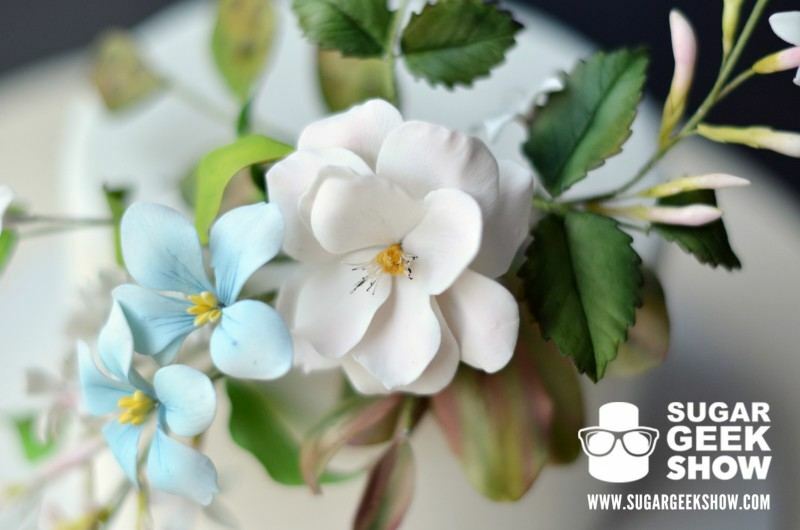 While great for beginners these sugar flowers are also wonderful additions to any professional’s flower arsenal. This 3 part tutorial is jam packed with info you don’t want to miss! Shaile offers so many amazing techniques and tips from assembly to dusting. She gives information useful for any other sugar flowers you may want to create while specifically showing how to make not 1, not 2, not 3 (takes a deep breath) but 4 different flowers! 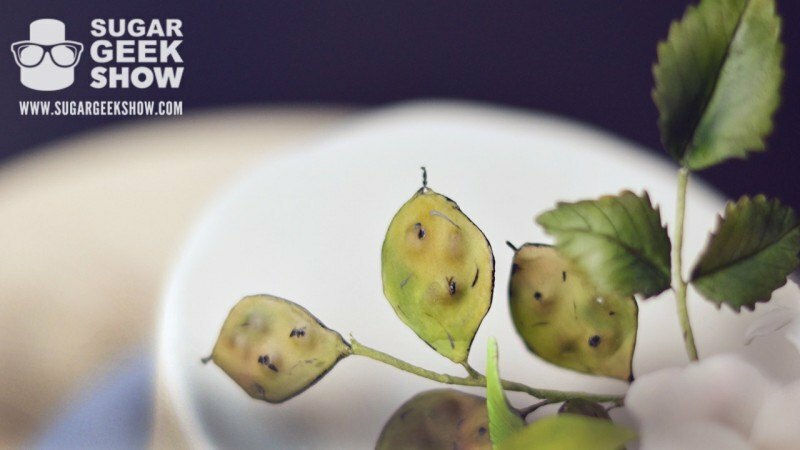 As if that wasn’t already amazing, she also shows you a variation of pods and leaves! 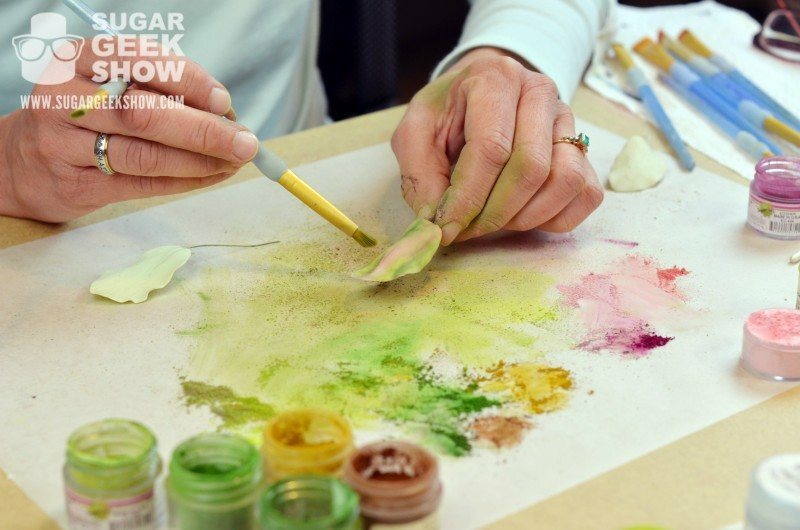 You may want to pick up some dusts from The Sugar Art if you’re in need of some colors and Shaile’s preferred gumpaste is Nicholas Lodge’s Recipe. So make up a batch and get ready to get your sugar flower on! This gorgeous open rose is the “star” of the floral spray. It’s simply stunning and is a wonderful addition to any arrangement either as the main focus or as a filler for larger flowers. The beautiful blue garden flowers have an understated beauty and simplistic charm that is really versatile. Create them in any color you like to match your arrangement and theme! Above, shown to the left of the garden flowers and jasmine is the lovely cherry blossom also taught in the class. Cherry blossoms seem to be super popular right now and definitely something you need to have up your sleeve! Jasmine is a unique flower that adds a ton of interest in this spray. The buds are a wonderful contrast to the structured open flowers they accompany. Shaile shows us how quick and easy the jasmine is with awesome shortcuts and techniques. Pods are something you don’t see taught very often. On top of that, have you seen how realistic these leaves are? Well, besides real leaves, of course. You may have forgotten we are looking at sugar and not the real deal. The pods have an awesome rustic feel and will give you something new to work with! Shaile shows the interesting and effective methods for achieving such amazing details. Does your brain hurt from all of the potential learning awesomeness that was just thrown in yo’ face?! Sort of like a brain freeze but with a lasting result of knowledge! Only if you actually go and indulge in everything these tutorials have to offer. 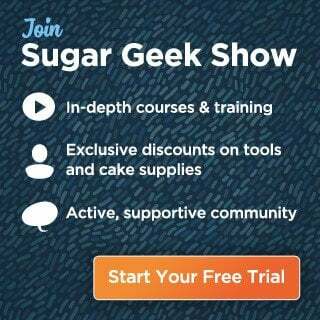 If you haven’t already become a paid member of the Sugar Geek Show, what is taking you so long? Do that here and then start with the Open Rose Tutorial. Look for the other two parts to the class that will be released later this month. I know, I know, now you’ve gotten all excited only to find out you’ll have to wait to see them all. Such is life. Hang in there, it’s totally worth the wait. In the meantime, who doesn’t like free info? Check out the Gumpaste Lotus Flower and the Gumpaste Dahlia as perfect tutorials to learn right meow!